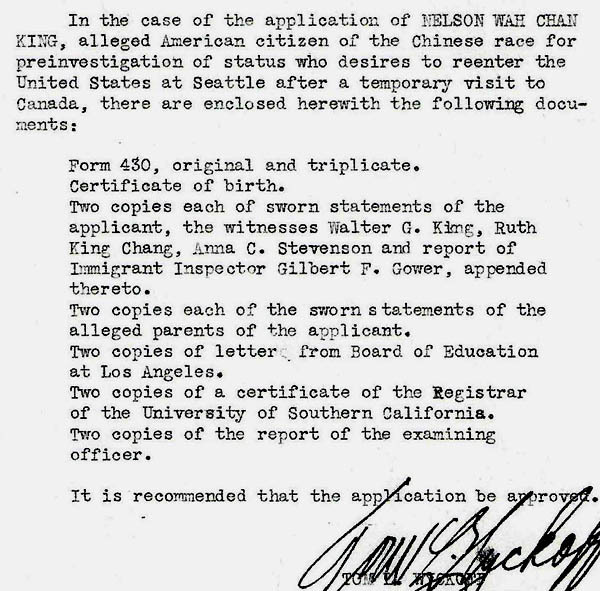 “List of documents in file for Nelson Wah Chan King” 1938, Chinese Exclusion Act case files, RG 85, National Archives-Seattle, King Wash Chan Nelson case file, Seattle Box 767, 7030/11344. 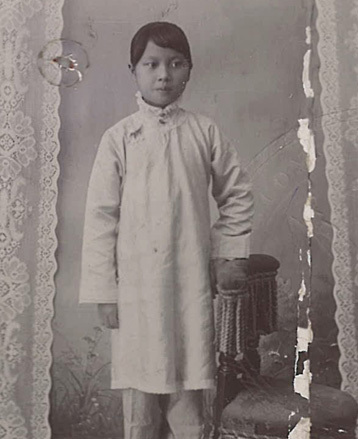 Nelson Wah Chan King was born on 10 June 1911 in Salt Lake City, Utah, the son of Harry N. King and Lily Dorothy Shem (maiden name: Shem Mowlan). His parents were both born in San Francisco. His father owned the Kwong Nom Low Restaurant in Salt Lake City, Utah before moving to Los Angeles, California to become a merchant. Although Nelson’s grandparents were born in China, Nelson, his parents, and his brother had never been to China. Nelson’s only sibling, Paul Ming King, was born 21 January 1918 in Salt Lake City and by 1938 was a student at University of California in Los Angeles. Nelson was working as a floor manager for the National Dollar Stores in Spokane, Washington, making $90 a month in 1938. His mother’s brother, Bruce Shem, was living in San Francisco with his wife and two sons. His father did not have siblings but he had four cousins in Salt Lake City– Walter G. King, a reporter for Salt Lake City Tribune; Ernest Q. King, M.D., a Reserve Flight Sergeant, U. S. Army and connected with a C.C. C. Camp; Raymond S. King, newspaper photographer; and Ruth King Chang, M.D. Nelson Wah Chan King’s paternal grandparents were Chan Mun Lok Way and Chan Lau Shee. His maternal grandfather was William C. Shem. Nelson could not remember his grandmother’s Chinese name—he just called her grandmother. She was living in San Francisco with her son Bruce Shem. Nelson Wah Chan King graduated with a Bachelor of Science degree in Pharmacy from the University of Southern California in Los Angeles in 1933. Nelson’s mother, Lily S. King, testified that her father was Shem Yow Ching and her mother was Leang Shee. In his sworn statement, Nelson’s father, Harry N. King, (Chinese name: Chan Hong), stated that he was an art dealer with the Tom Gubbins Company and his father’s name was Chan See Gern. Anna C. Stevenson also testified in Nelson’s behalf in 1938. She was a 70-year-old widow who had lived in Salt Lake City for 35 years. She had owned the apartments on Vissing Court where the King family had lived. She stated that Nelson’s mother was brought up in a Methodist home in California. Anna had last seen Nelson in 1936 on her birthday, 6 August. He brought her a present from the King family. 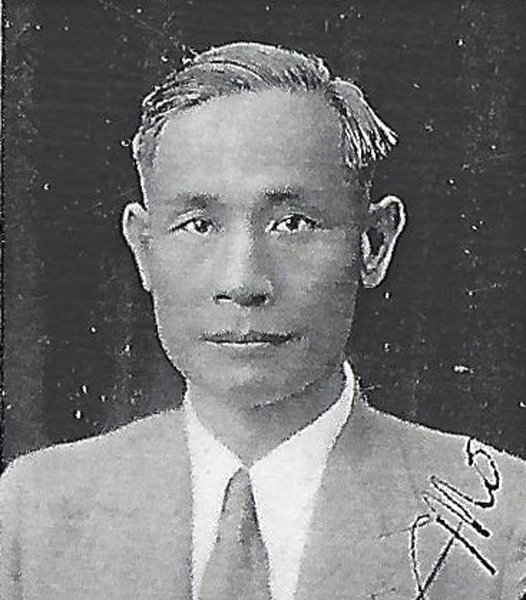 On 23 August 1938 Nelson Wah Chan King notified the Immigration office in Seattle that because of his transfer to New York City he would not be making his trip to Canada. It is the last document in his file. “Photo of Soong May Ling, Chinese Certificate for Section 6 Student Exemption,” 1907, Chinese Exclusion Act case files, RG 85, National Archives-Seattle, Soong May Ling case file, Seattle RS Box 39, RS 1483. Soong May Ling (sometimes spelled Soong Mai-ling) age 9, and her sister, Soong Ching Ling, age 14, (Seattle RS Box 39, RS 1479) arrived in Port Townsend, Washington on the S.S. Minnesota. They came from their home in Shanghai, China as Section 6 students and were admitted. The 1907 Section 6 Certificate is the only document in the file. The file contains correspondence from 1943 between Earl G. Harrison, Commissioner of Immigration and Naturalization, Philadelphia, Pennsylvania and Raphael P. Bonham, District Director of Immigration and Naturalization in Seattle, Washington. Harrison asked Bonham to confirm that Soong May Ling was admitted into Seattle as a student in 1907. Bonham replied that “a charming little Chinese maid” had arrived with her sister “now also a lady of renown.” Bonham asked a local Chinese Consul to examine the document for its authenticity. It passed his scrutiny. Bonham concluded that Soong May Ling “was the now world-famous and accomplished Madame Chiang Kai Shek.” Bonham had the photo from the 1907 certificate copied and sent three prints and the negatives to Harrison hoping that he would forward one to Madame Chiang Kai Shek. “Correspondence between Harrison and Bonham,” 1943, Chinese Exclusion Act case files, RG 85, National Archives-Seattle, Soong May Ling case file, Seattle RS Box 39, RS 1483. President Franklin D. Roosevelt repealed the Chinese Exclusion Act on 13 December 1943. Madame Chiang Kai Shek lived to be 105 years old and had a fascinating life. Read more about her! 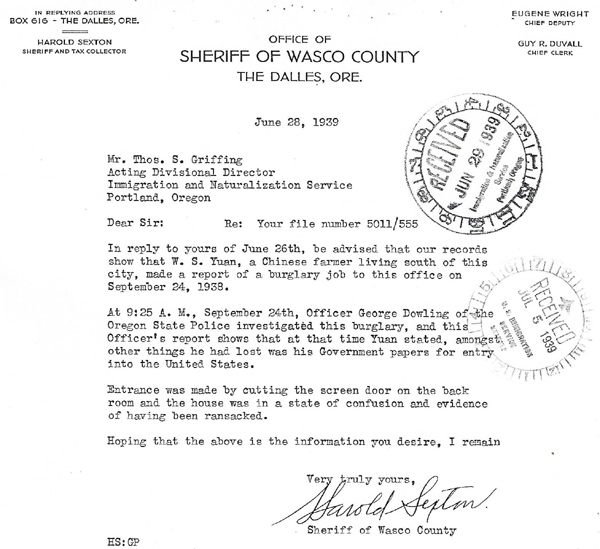 “Letter from the Sheriff of Wasco County, The Dalles, Oregon,” 1939, Chinese Exclusion Act case files, RG 85, National Archives-Seattle, Won Suey Yuan case file, Seattle Box 1367, 40718/12-28. On 24 September 1938 the home of Won Suey Yuan, a farmer in The Dalles, Oregon since 1923, was broken into and his Certificate of Identity was stolen. Won immediately filed a claim with Harold Sexton, the Sheriff of Waco County in The Dalles and reported it to Immigration Inspector Howard P. Swetland, Portland, Oregon. The sheriff visited the scene of the robbery, believed the claim was legitimate and filed a report. Won testified that on the evening 24 September 1938 between six and eight, he took his son, Won Loy Duck, to town for a haircut. Upon their return he saw that someone had entered the house by cutting the screen in the back door. The house had been ransacked but the thief only took a black tin box which contained Won’s valuables– his Certificate of Identity, a New York Life insurance policy and a gold nugget watch charm. The certificate was by far the most valuable item in the box. Without it Won could not travel outside the U.S. and could be deported if he could not prove his right to be in the United States. The investigator asked Won Suey Yuan if he thought the robber specifically wanted his certificate. Won was the only Chinese person within eight or nine miles of his house so he did not think the robber was Chinese or that he wanted his Certificate of Identity or would know how valuable it was to a Chinese person. Shortly after the robbery Won had a friend, Ralph Welborn, notify the Seattle Immigration office of the incident. When Won Suey Yuan applied for a duplicate certificate his case files were thoroughly investigated. He did not have a problem getting a replacement certificate but it created a great deal of paper work. Won originally entered the United States through San Francisco in 1907 and that file, number 19768/12-7, was reviewed. It confirmed that he received his original certificate on 20 December 1920. Won Suey Yuan’s file showed that he had made several trips to China since his original entry at San Francisco as the son of U. S. citizen. 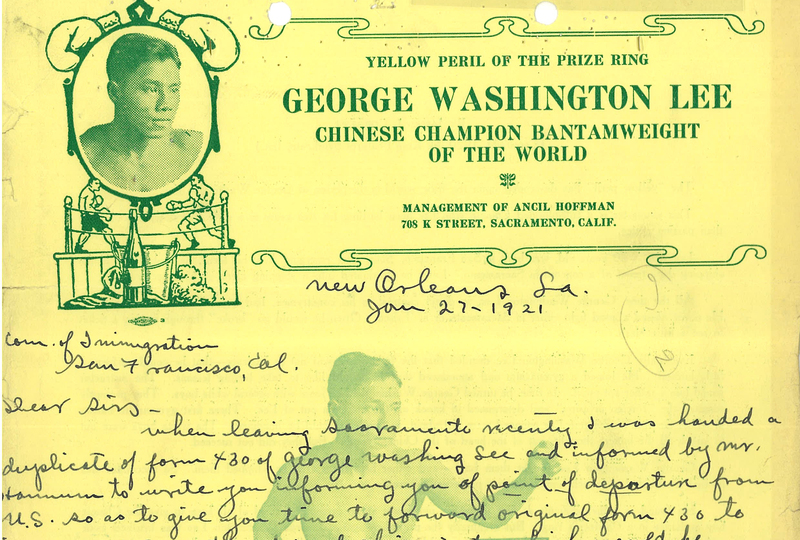 His San Francisco file lists his father’s name, Won (Woon) Tong Wing, file 17472/20-8, and the San Francisco file numbers for three of his six brothers. Won also made a trip to China in 1921 departing and re-entering through Seattle and that created a Seattle file, number 35100/4302. Won Suey Yuan’s marriage name was Won Suey Hop (Hock). He was born in Wun Bin Village, Sun Ning District, China on 28 March 1895. He and his wife, Seid Shee, had three sons, Wong Loy Duck (file 7030/4513), living in Portland or Salem, Oregon; Won Loy Sing (file 7030/12118), in the process of coming to the United States in 1939; and Won Lum Bing, in China. On 29 August 1939 Won Suey Yuan was issued Certificate of Identity No. 80068 in lieu of his lost certificate No. 32415. 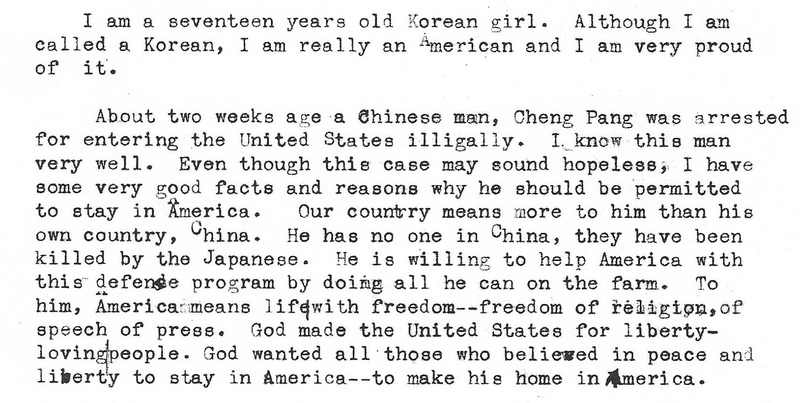 “Letter of Support by Ruby Whang,” 1941, Chinese Exclusion Act case files, RG 85, National Archives-Seattle, Chin Back Pang case file, Portland, Box 107, 5023/80. 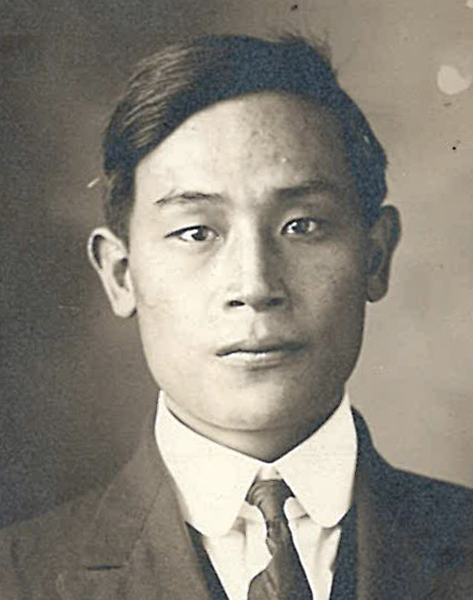 Chin Back Pang, who was in his early 50s or 60s, was arrested in Portland, Oregon in May 1941—he was a Chinese-born laborer without papers. He arrived in the United States as a stowaway about 1918. There is no information in the file of how it was discovered the Chin was an illegal. He worked on a farm and there is no mention of him getting into trouble. 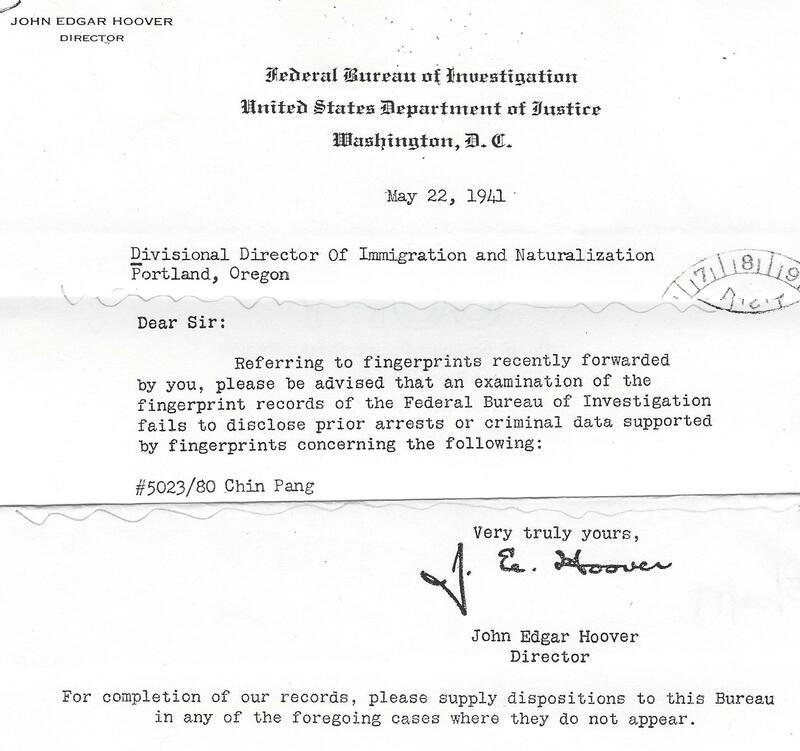 “Letter from J. Edgar Hoover to Portland Director of Immigration, 1941” Chinese Exclusion Act case files, RG 85, National Archives-Seattle, Chin Back Pang case file, Portland, Box 107, 5023/80. Chin Back Pang was deported. “Ancil Hoffman Letter regarding George Washington Lee,” 1921, Chinese Exclusion Act case files, RG 85, National Archives-Seattle, George Washington Lee & Raymond Lee case files, Seattle, Box 1349, Case 40233/1-1 & 40233/1-2. Lee Moy serviced in the U.S. Army as a mess attendant on the U.S.S. Pinta and was receiving a pension for his military service. He worked as a cook after his stint in the army. Ira M. Conran, Chief of Police, Sacramento, Mr. Tharpe, a detective, and Ted N. Koening, a policeman, all testified that they knew George Lee since he was a child. A copy of a torn family portrait was included in the file. The inspectors were satisfied with the applications and they were accepted. 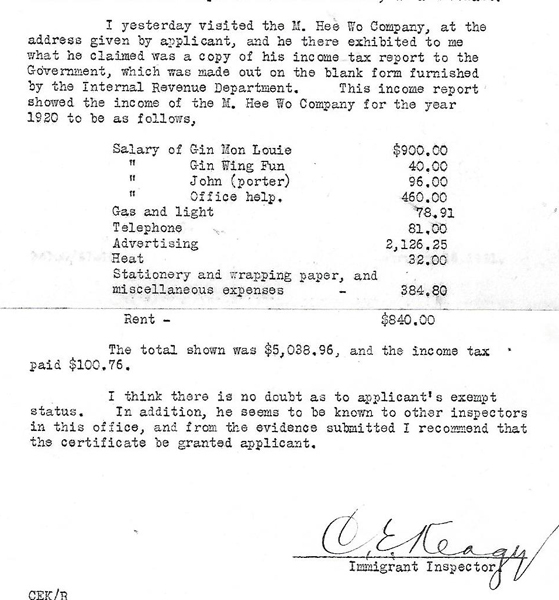 Letter to the Seattle Immigration Inspectors, 1927, Chinese Exclusion Act case files, RG 85, National Archives-Seattle, Chin Hung file, Seattle, Box 1019, Case 7060/17-28. Immigration Inspector Thomas Thomas, District Director, Immigration Service, Cincinnati, Ohio had found the Yee San Company to be a bona fide mercantile establishment and he was impressed by the reputable and creditable witnesses. He recommended that Yee Yook Poy’s application be granted but in spite of this, Yee Yook Poy was denied admission and sent back to China. Why?? Yee Yook Poy’s file mentions several anonymous letters and cross reference’s Chin Hung’s file. The two young men arrived together in Seattle on 6 June 1927 and were deported 5 December 1827. Yoo Yook Poy’s alleged father was original admitted as a merchant [this was questioned in the testimony] and the father-son relationship was not established to the satisfaction to the Commissioner of Immigration. Chin Hung was the alleged son of Chin Woo, alleged merchant. The credibility of Cleo Barnes and Ben J. Miller as witnesses was in question because they were employees of Yee Jung Sam. The file contains over 100 pages of pro and con testimony but the most damning information seems to be the controversy regarding the merchant status of Yee Yook Poy’s father and it mentions three anonymous letters. One signed letter written in Chinese was translated is included in the file. It is not known how this letter affected the career of Immigration Inspector Thomas Thomas. Other white witnesses were Charles E. Nixon, William W. Wheaton, Emmet Leist, A. L. Dunbar, B. H. Latham, Ensign Gadt, C. F. Croezinger, Mrs. John Frey, Louis Miller, Charles Davis, and Chinese witnesses, Yee San and Yee Jung Sam, all of Columbus, Ohio. Chin Hung and Chin Woo photos, 1927, Chinese Exclusion Act case files, RG 85, National Archives-Seattle, Chin Hung file, Seattle, Box 1019, Case 7060/17-28. 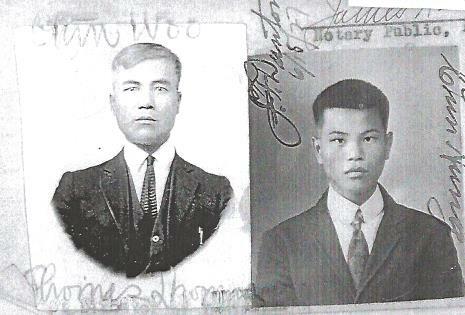 Photos of Yee Jung Sam and Yee Yook Poy, Declaration of Non-Immigrant Alien 483, 1926, Chinese Exclusion Act case files, RG 85, National Archives-Seattle, Yee Yook Poy file, Seattle, Box 1019, Case 7060/17-19.